The G7 X has a 20-megapixel, 1-inch sensor, backed by a 24-100mm f/1.8-2.8 lens. Compared to the latest RX100 III, which has just a 24-70mm f/1.8-2.8 lens, the G7 X zooms a bit further without being any bigger. That means Canon out-engineered Sony to get some extra magnification into a tiny frame. In addition to the lens, the camera's big distinguishing feature is that the G7 X's selfie-friendly LCD is a capacitive touchsceen, whereas Sony's doesn't do touch. The Sony camera for its part has a pop-up viewfinder built-into the camera. In our test, it wasn't anything special, but it still might be appealing to some users. The upside for the G7 X is that it still has a built-in flash. 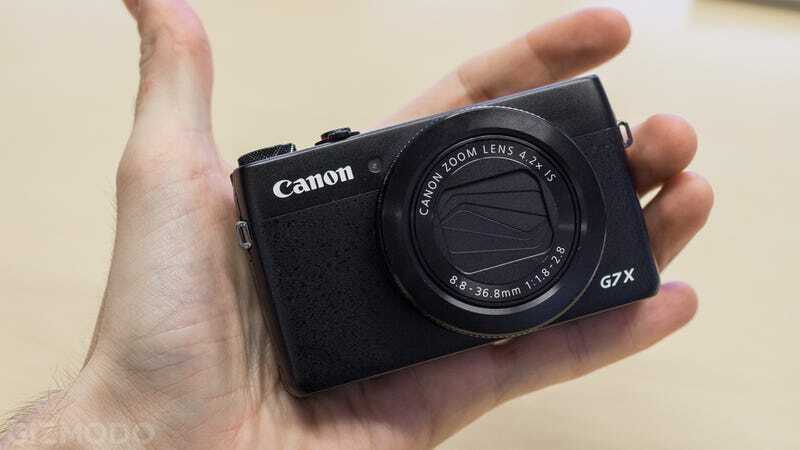 Besides that, the G7 X leans towards the better specs we've seen on top point-and-shoots before: built-in ND filter; 1920 x 1080 video recording at up to 60p; Wi-Fi and NFC built-in. The Canon G7 X needs to beat the RX100 III, and it's got a chance. At $700, the G7 X costs a bit less than the Sony camera. Additionally, it offers just enough difference on features that it might give the current king a run, especially since Canon's name carries so much weight in the camera world. The PowerShot G7 X will be available in October.